40. ‘How to Read, or Why’. New York Herald Tribune Books 5/17 (13 January 1929): 1, 6; 5/18 (20 January 1929): 5-6; 5/19 (27 January 1929): 5-6. By 1929 Pound’s enthusiasm for ‘things Japanese’, including the nô, had faded (see also 59e-f and 83). In this work designed to provide a ‘minimum basis for a sound and liberal education in letters’, he lists Confucius first among major writers, finds that ‘Fenollosa’s essay on the Chinese written character  opens a door that . . . earlier students had . . . been unable to open’, and hopes for ‘a few of the best Chinese works [to be] printed bilingually, in the form that Mori [Kainan] (Ap) and Ariga [Nagao] (Ap) prepared certain texts for Fenollosa’ (see 15), but does not mention a work of Japanese literature. By 1938 Pound’s enthusiasm for the nô had returned (see 45b), and stayed with him. 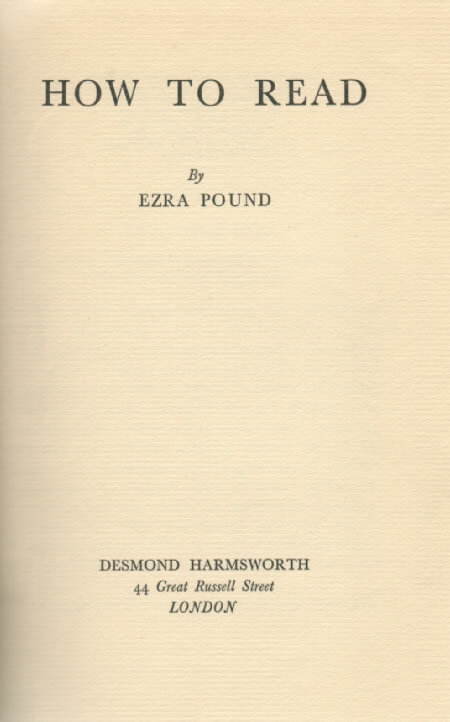 Reprinted as How to Read (London: Harmondsworth, 1931) and in Polite Essays (London: Faber & Faber, 1937).